DEA Destroy 30,000 Plants, But They Get It All Wrong.. Again. In the DEA’s latest massive raid on the Menominee Indian tribe of Wisconsin, they destroyed 30,000 marijuana plants, infuriating and confusing tribal leaders. In the DEA’s latest massive raid on the Menominee Indian tribe of Wisconsin, they destroyed 30,000 marijuana plants, infuriating and confusing tribal leaders. 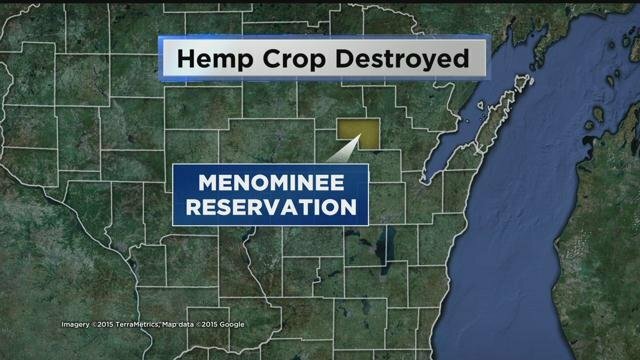 The leaders of the Menominee tribe said that the plants were in fact hemp and not marijuana, but the authorities are trying to prove otherwise. The tribe of Wisconsin believe that an enormous waste of resources occurred at the hands of the DEA during this raid, and that it is not fair that their project was destroyed while marijuana is being sold recreationally in other parts of the USA. The leaders of the Menominee tribe plead to the DEA that their project was for the lawful research of hemp. These plants were going to be used as fibers, food and oil. These plants were intended to be industrial hemp plants, the two being distinguished by the levels of THC in the plant. However, when the DEA ruined and seized their 30,000 cannabis plants, a specific tested level of THC was never included in the affidavit. The affidavit submitted by the DEA agent simply stated that “samples taken tested positive for the presumptive indication of marijuana”. In fact, the testing required to identify the levels of THC in a plant are exhaustive, time-consuming and require loads of calibration. There is no evidence that the DEA tested at all for the levels of THC in these cannabis plants, therefore never correctly identifying whether the plants were hemp or marijuana. In 2014 the federal government in the USA passed a bill that states were allowed to implement their own pilot programs for the agricultural research of marijuana. Since then states like Kentucky and Colorado have made the move to do this and earlier this year the Menominee said that they would too. The tribe believes that they are acting within their lawful rights to host an industrial hemp research project. It seems that the DEA, on a whole, is not being interpreted the way that they perhaps intended to when the federal government passed this bill in 2014. Reformists and tribes that are dedicating their lives to the research and legalization of this plant are infuriated. This is also not the first action that has been taken against tribes performing marijuana experiments. Earlier this year two tribes in California were raided by the DEA for their cannabis plants. He says that it is dangerous territory to be encouraging investments and then performing raids, because all those who invest also lose their money. The Menominee tribe even appealed to the DEA before their plantation was ruined to speak before a federal judge and have the matter heard, with proper testing of their plants. However, the DEA went in and raided the property anyway, not giving the tribe a chance to be heard before a federal judge.